Keeps your clothes & jewellery were you want them all day! Keeps your garments in place all day! Keep your socks & costume in place during your performance! 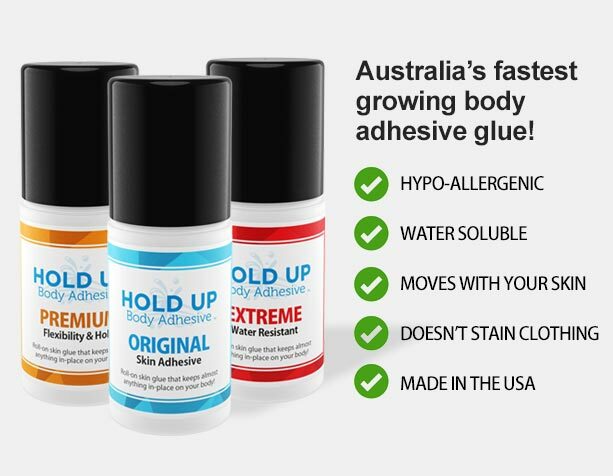 The hypoallergenic, low-irritant body adhesive glue that removes the constant adjustment hassle. The quickest and most comfortable way to stop the constant pulling-up and re-adjustment battle with your clothing and jewellery. Your SECRET Tool for Keeping Everything in Place All Day! Applied with a convenient roll-on applicator and easily removed with water or a damp cloth. No sticky mess and No staining your clothes. Medical Garments | Irish Dancing | Gymnastics | Socks & Fashion | Wigs | Costumes | & Much More!